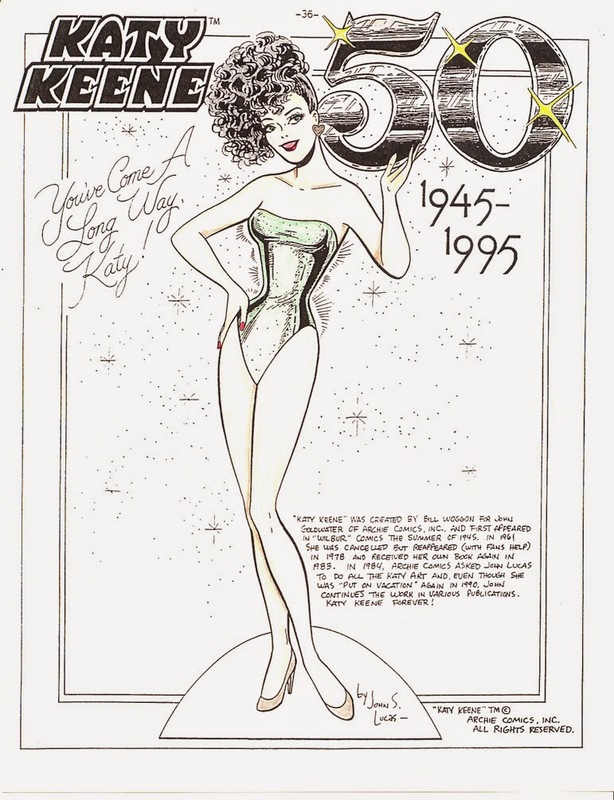 Katy Keene - Comic book heroine who has been compared to Betty Page and ranks in at #57 on the "100 sexiest women in comics." 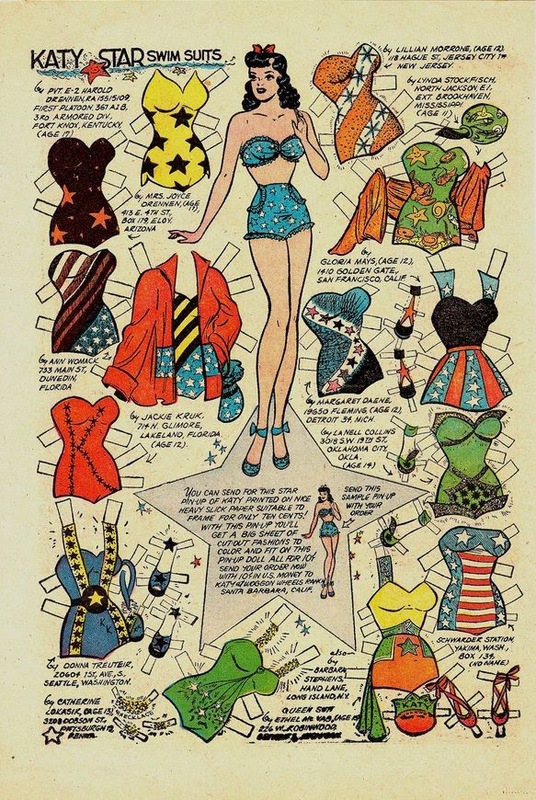 But what intrigues me today are all the fabulous swimwear fashions she has! 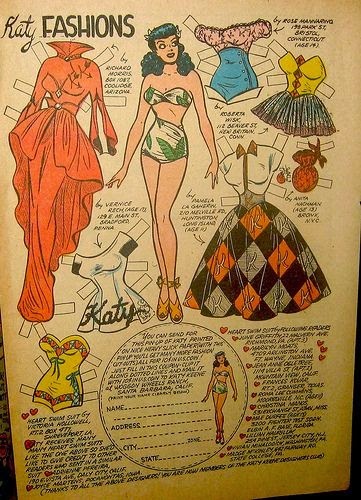 Katy launched in 1945 published by Archie Comics. She certainly has the 'pin-up' style. Do a google search for images of Katie Keene and you can spend hours deciding what outfit she will wear. 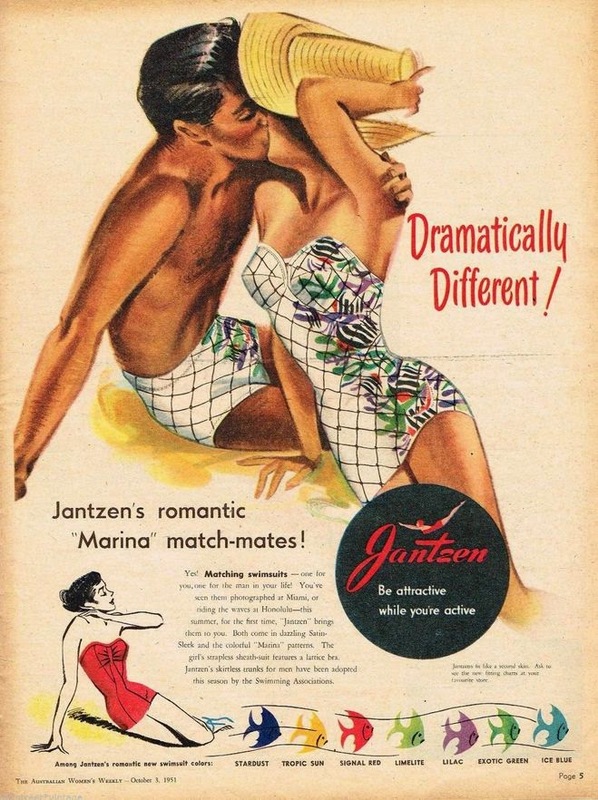 Australian advertisement from Jantzen swimwear 1951, Be Attractive While You're Active. Love that headline. What's 'dramatically different' in 1951? Marina Match-mates, matching swimwear for you and your partner, that's what. 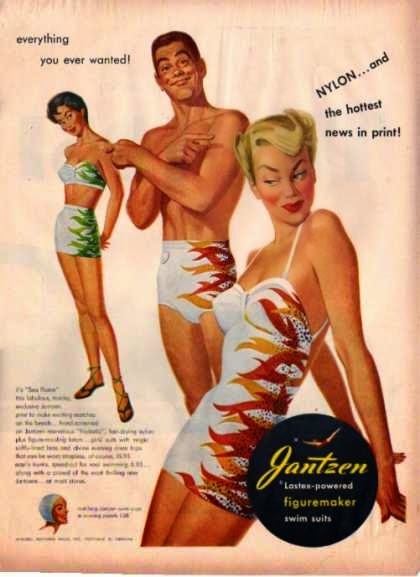 NEW from Jantzen. D) The seasonality made it more appropriate to launch later. Who know, but I find these types of details intriguing. 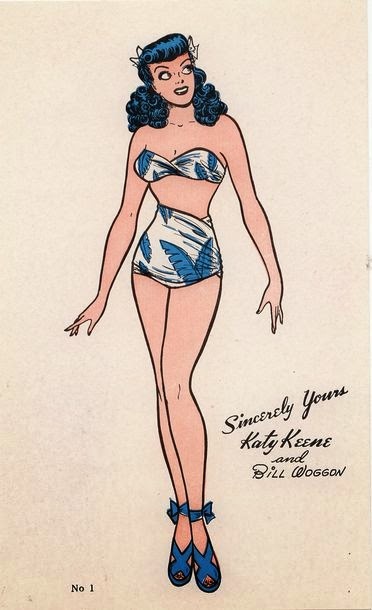 Either way, it's safe to say, matching swimwear ensembles began in the very early 1950s. 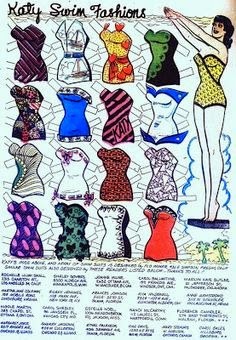 Vintage wool bathing suits from the 1920s and 30s are becoming increasingly difficult to come by as time marches on. The effects of time, sunlight, age, and little critters can make a disaster out of wool in no time. That's why it's such a pleasure when I find early pieces with provenance to help support identification and attributes. 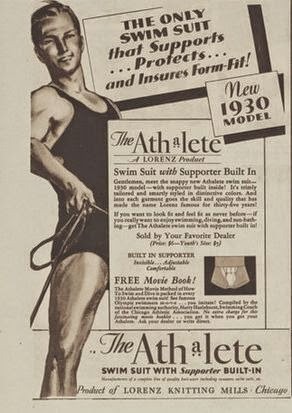 Case in point, this wonderful Lorenz Knitting Mills men's bathing suit from 1930. Sorry, I don't own a male mannequin as of yet so this wool swimsuit is being modeled on my female mannequin. But what I want to share with you is the piece, the label and the ad. The ad for this suit is from 1930. It 'supports and protects' at the same time because of the new built in supporter. 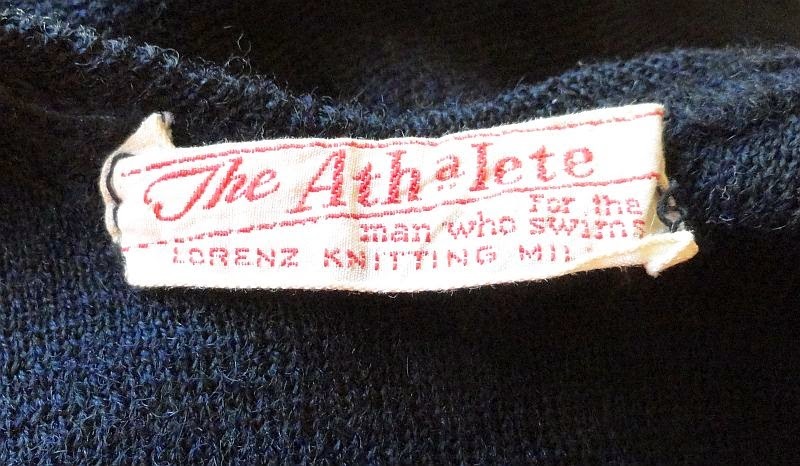 I've not been successful in finding out much information about the Lorenz Knitting Mills other than they also produced novelty sweaters for women. We've just listed this piece on Glamoursurf.